Buying a high quality industrial sewing machine makes upholstery sewing projects easier than they would be with an average household sewing machine. Upholstery and re-upholstery jobs are easier to do with an industrial machine than on a regular household machine. The sewing fabric used for upholstery is heavy to begin with. Then, it is often necessary to attach the fabric to foam backing. Not just any sewing machine will be able to stitch through that kind of thickness without either breaking needles or the machine itself. A good machine for sewing upholstery fabric will have a power stand with a 1/2 horsepower motor and a smaller pulley. According to Ultimate Sew & Vac larger pulleys - around four inches in diameter - are for speed while smaller pulleys are for power. While speed is nice for an every day sewing machine operator making clothes, sewing through heavy upholstery fabric requires power. A good industrial sewing machine will have a sewing stitch rate in the range of 5,000 stitches per minute. In spite of the incredible stitch speed of industrial machines they are reasonably easy to use because each industrial sewing machine does only one function - or one type of stitch. A household sewing machine will usually do at least a straight stitch and a zigzag stitch. Single functionality brings with it incredible speed, strength, and perfectly even stitches. A big bobbin machine is one of the first things to look for when it is time to buy an industrial sewing machine for upholstery. A machine that runs a class M bobbin is ideal for the heavy thread and fast sewing involved with upholstery. According to R&M Crafts a class M bobbin is 1" in diameter compared to the 3/4' class L bobbin. Having a bobbin that holds more thread means less lost time refilling and changing bobbins. Another feature that is useful on an industrial sewing machine is a side-mount bobbin winder. A conveniently placed bobbin winder will run off of the machine's belt when engaged. It should be easy to reach and should operate smoothly. If the industrial sewing machine does not come with this installed it can be an inconvenience - but is neither too complicated to install nor especially expensive. A compound walking foot makes it easier to sew through heavy upholstery materials in a process that is often very much like quilting. The walking foot - if watched at a slow speed - creates a motion that is similar to small steps. One part of the foot helps to hold the material in place as the other part steps forward. This helps prevent the fabric from bunching and twisting while going through multiple thicknesses at a high rate of speed. To get a good industrial machine be aware of deceptive terminology. Semi-industrial, heavy duty, and industrial strength do not actually indicate that the machine in question is an industrial sewing machine. To determine if the sewing machine is actually an industrial sewing machine check the motor's horsepower and the stitch speed. The best thing to do when it is time to buy an industrial sewing machine is do a little bit of research so the machine will do the needed job. It is one thing to know a big bobbin machine is what is needed. It is even better to know how a big bobbin looks. There is nothing wrong with asking a lot of questions and taking the time to research sewing machine features. If in doubt it is helpful to take an experienced industrial sewing machine operator to inspect the machine before purchasing it. Learning to sew at a young age gives children a fun, creative, and useful talent that gives life-long pleasure - whether it is hand sewing or using a sewing machine. Knowing how to sew is a useful skill that also creates opportunities for creative expression. Past generations have passed sewing skills from generation to generation. Sadly, many traditions that in the past surrounded sewing's heritage has been bypassed with the introduction of inexpensive imported textile products. Buying fabric and sewing notions can get expensive and sewing tends to be a time-consuming process. It can be hard to justify making an item that can be purchased for a lower price at the local department store. There are, however, valid reasons to sew and to teach children to sew. When someone makes an item themselves they know for certain their item is one of a kind. It is nice to have something no one else can get. Children tend to be proud of having things that are special, unique, and things they have created by themselves. Things do not always last as long as they should. A lot of times a small problem - like a loose button - arises that can be easily repaired. Sometimes a small, inexpensive sewing task can save a piece of clothing or other textile article. If a button falls off or a seam tears loose knowing how to repair the damage saves the cost of replacing the whole thing. Another great reason to teach children to sew is that it is satisfying for both the child and the teacher. A relaxed attitude - by both the adult and the child – makes learning to sew especially enjoyable. Sewing instruction can be a wonderful bonding experience for both parties. The teacher gets the satisfaction of knowing they have shared a useful skill while the child will have a fond memory of the time to always remember. Every time the child sews will be an opportunity to fondly remember the day they learned a particular stitch or how to fit a pattern. Hand sewing is the best way to begin teaching boys and girls how to sew. Small children do best if they start with a large plastic sewing needle, yarn, and loose-weave fabric. The plastic needle lets them get used to get a feeling for hand sewing without the risk of getting poked. Switching to metal needles, regular sewing thread, and sewing notions - like buttons - is the next step. Being able to fix a small rip or to sew a button on so it will stay put is something everyone should know. Anyone who wears clothes should really know how to securely put a button back if it falls off. Beginner level sewing projects are the next part of the progression of teaching a child to sew after basic hand sewing repair has been taught. The easiest way to approach this stage is to buy a sewing pattern. Sewing patterns are available for all sewing skill levels. 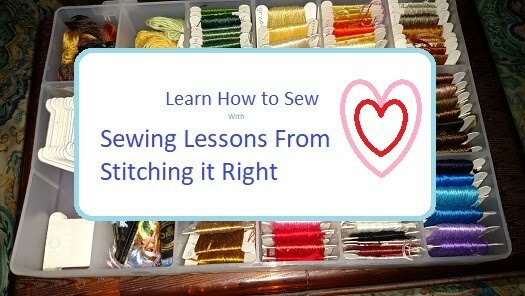 A good beginner pattern should be marked as easy, sew easy, or beginner. Ideas and patterns for sewing crafts are easy to find at a beginner level. Some easy beginner sewing projects are elastic waist shorts; pull over shirts, hat sewing, and sewing eco-friendly tote bags. Useful sewing projects like clothing that can be worn to school or the park and cute sewn crafts will be the most likely to delight children. Image of woman teaching child to sew courtesy Wikimedia Commons. Starting a small home-based business can be an intimidating prospect. This is especially true for crafters who want a reliable place to sell their designs,but don't want to invest in the high overhead associated with buying or renting a store-front. eCrater gives home crafters a way to sell handcrafts without taking on the burden of any overhead. The Internet gives small businesses the chance to compete with big businesses by taking advantage of eStore options. Profile of eCRATER's service. Small business has had a hard time competing with bigger businesses. The amazing growth of big box stores like Wal-Mart and the popularity of cheap foreign imported products has been a force that causes many small businesses to fold. Gaining an advantage against larger competitors has become a task so daunting many small businesses have no choice other than to close up shop. It is hard to stay in business while selling a quality product at a competitive price. Ecommerce options open doors for small organizations by reducing the cost of overhead required to open a storefront. The overhead cost involved with opening even a single physical store front often excludes entrepreneurs with low budgets from starting a business. A web store gives small businesses the chance to sell not only in the immediate area- businesses can also sell to a broader geographic area with a single website. Small business leaders will find that the popularity of online shopping has grown while developing an online store has become both easy and inexpensive. The overhead that was choking many small businesses out of existence can now be avoided by opening an e-store that has a shopping cart feature and secure checkout. Even a single person making art craft treasures at home can compete in the same arena as larger competitors. Many web hosting services offer websites for online businesses that are free for a trial period. Small business- as well as home business- leaders will appreciate the ease of starting and maintaining a free website with eCRATER. rater stands out by promoting itself as a 100% free marketplace. Sellers are provided with a free online store – with unlimited capacity - that can be customized with text and photos. eCRATER is also part of a popular online community. A certain number of customers will find the new estore without any promotion at all because community members browse through at their leisure and check out new store fronts. Small businesses and individuals who sign up to sell with eCRATER gain the benefit of being able to accept payments through either PayPal or Google checkout. Sellers get to accept different types of payments without spending extra to set up with a credit card processing company. Customers get the advantage of being able to use a credit card and a secure checkout. The main downside to opening an eCRATER store is that the procedure for setting up the shipping feature can be confusing. It is easy to get excited about finding a free, dynamic ecommerce option that allows for a higher profit margin and overlook important set-up details. A small business will not want to lose money on shipping as a result of setting up the shipping matrix incorrectly, so careful review will be time well spent. There are many excellent web hosting options for small businesses. eCRATER is simply one hosting option that has a lot of benefits for sellers. eCRATER is an e-store option that provides the features small businesses need to get started in e-Business. eCRATER is easy to use for both the seller and buyer, making it a good online store option for a small business to consider. If you've ever wondered how stores can sell garments at a lower price than you can make them, the answer is buying in bulk. It can be tough to buy in bulk for home sewing; who has room to store a bunch of extra fabric and supplies. One way to take advantage of bulk discounts, is to either get together with a bunch of home sewing friends, or join a fabric co-op. Once in a while you can also get a great deal on bulk sewing supplies on auction sites, like ebay. I know of a great fabric co-op; if anyone is interested leave a comment and I can either email the information to you, or post it here in the comments. Or, if you know of a great co-op, feel free to leave a comment. We're always looking for reliable, low-priced sewing supply sources. Button image courtesy Jorge Barrios and Wikimedia Commons.